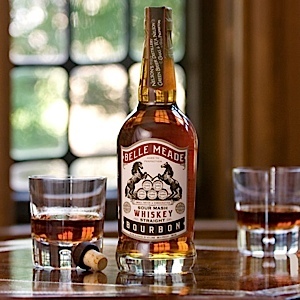 The first in a series of small-batch bourbon reviews, Wendell Brock tries Belle Meade, an upstart brand steeped in history. Over the holidays, I decided to give a special person a bottle of a favorite small-batch bourbon. But when I went down to my local booze shop to pick up a bottle, the shelf was empty. FML! Only four shopping days left. Don’t pull a Pappy Van Winkle on me and tell me I have to get on a waiting list. Out of nowhere, this guy, this shop clerk, this angel of the Lord appeared to nudge me toward an elegantly proportioned bottle with a light amber glow, a handsome label and a name that has a kind of Tennessee Williams sound to it. Belle Meade. Very tempting. But I passed. Proceeding to another store, I found the whiskey I wanted, but I couldn’t take my eye off the Belle Meade and its historic-looking insignia: a bookended pair of thoroughbred racehorses rearing up over a stack of barrels bearing the words: “Straight bourbon whiskey.” As I stood there dreaming, the scene from the previous store replayed itself—like a “Groundhog Day” moment. An employee—this time a merry elderly fellow—stops by to bray about Belle Meade, a 90.4 proof sour mash with a Tennessee pedigree. But back to the bourbon: I have nearly finished off my first bottle of Belle Meade and am looking forward to my second. As bourbons go, this one has a remarkably sweet nose with beguiling vanilla notes. The first sip packs a bracing astringency that nips at the tongue like a fine rye or superbly aged Caribbean rum. (In fact, Belle Meade is about 30 percent rye.) Give it a swirl. Let it breathe a few minutes. And you get a delicious payoff: a mellow caramel finish redolent of peat, oak, spice and Calvados. It’s a good drink for a contemplative sip. A cube of ice or a drop or two of cold water turns it into a gentle pillow. Hell, I’m not ashamed to admit that I like Belle Meade with a glug or two of ginger ale and “plenty of chipped ice,” as Blanche DuBois might say. And so a journey that began with an empty shelf and a near freak-out ends on a high note. I’m pretty happy about it.